Accounts exist of the Sphinx as an oracle, as a king's burial chamber, and as a temple for initiation into the Hermetic Mysteries. Egyptologists have argued for decades about whether there are secret chambers underneath the Sphinx, why the head-to-body ratio is out of proportion, and whose face adorns it. 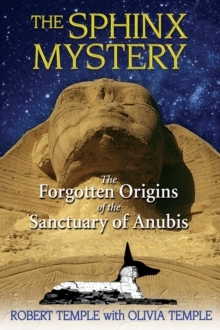 In The Sphinx Mystery, Robert Temple addresses the many mysteries of the Sphinx. He presents eyewitness accounts, published over a period of 281 years, of people who saw the secret chambers and even went inside them before they were sealed in 1926--accounts that had been forgotten until the author rediscovered them. He also describes his own exploration of a tunnel at the rear of the Sphinx, perhaps used for obtaining sacred divinatory dreams. In addition, he provides photographic evidence of ancient sluice gate traces to demonstrate that, during the Old Kingdom, the Sphinx as Anubis sat surrounded by a moat filled with water--called Jackal Lake in the ancient Pyramid Texts--where religious ceremonies were held. He also provides evidence that the exact size and position of the Sphinx were geometrically determined in relation to the pyramids of Cheops and Chephren and that it was part of a pharaonic resurrection cult.